Is undiagnosed PTSD causing your chronic stress or fatigue? Are you chronically stressed out, chronically fatigued, or both? Are you careful about your diet and lifestyle but nothing works? You may want to consider whether post-traumatic stress disorder (PTSD) plays a role in your poor stress-handling ability. Studies show PTSD alters the body’s ability to regulate cortisol, our primary stress hormone produced by the adrenal glands. People with poor adrenal function suffer from usually either low cortisol or high cortisol. Altered cortisol levels increase the risk for developing chronic conditions, such as autoimmune disease, chronic pain, or chronic inflammation. Not just war veterans suffer from PTSD. In fact, more women than men suffer from PTSD. Why? For one, more girls than boys suffer sexual abuse as children, predisposing women to more severe reactions to traumas later in life. Researchers also found that sexual trauma causes more emotional suffering and is more likely to contribute to a PTSD than other types of trauma. Women are also biologically more prone to PTSD than men. Are your stress hormones to high or too low? Low cortisol causes low blood sugar, blacking out when standing up, weakness and fatigue, waking up at 3 or 4 a.m., depression, hypersensitivity, and an inability to cope with stress. High cortisol causes symptoms of insomnia, not feeling rested after sleep, weight gain around the abdomen, anxiety, chronic stress, and hormonal imbalances. Supporting adrenal function is fundamental to good health. The first place to start is with diet, as many cases of =low or high cortisol are simply a matter of too much sugar and too many processed carbohydrates. Undiagnosed immune reactions to foods, such as gluten, dairy, egg, and soy can trigger adrenal issues. An undiagnosed and chronic parasitic, viral, or bacterial infection can take their toll on the body’s stress handling abilities and cause low or high cortisol. And, of course, lifestyle factors affect adrenal function. 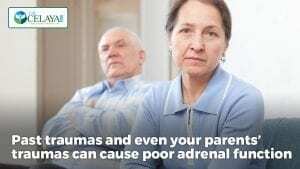 Over exercising, over working, not getting enough sleep, or being in a stressful job or relationship can certainly tax your adrenals and lead to altered cortisol. But if you have been addressed all those and low or high cortisol persists, it’s time to investigate whether PTSD is a contributing factor. Studies have shown that PTSD can cause low or high cortisol. An interesting finding is that people tend to have low cortisol if both parents suffer from PTSD. This is likely due to both the biological effects of PTSD as well as the child’s environment growing up. Research has also found that low cortisol is more often associated with the PTSD symptoms of avoidance, withdrawal, and isolation, while high cortisol is associated with hyper arousal and re-experiencing traumatic events. Cortisol plays a significant role in your physical and mental well-being and if you suspect you may have PTSD, it’s important to seek non-pharmaceutical treatments. Fortunately, PTSD is much studied these days and many treatment options exist.